Part of the fun of freeing myself from having to use my own pictures on certain cards is the fact that I can go back and make cards that should have been made. 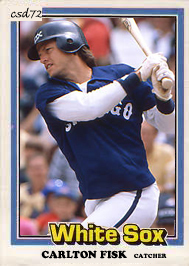 Carlton Fisk signed with the White Sox in March of 1981 so the card companies did not have the proper time to make a White Sox card of the catcher. All three companies featured him as a member of the Red Sox in their 1981 base sets. Topps gave Carlton a White Sox card with their traded set, but the other two companies were probably more worried about year two of their brand than updating cards at the time. I decided to see what a White Sox Donruss card of Carlton would have looked like back then. I wanted to include the pajama uniforms, and they are hard to find. I think that I was lucky to find this pose in a format that was usable for the card. In the future I may do a ’81 Fleer version as well. We will see. This is one of my older templates, but for the purposes of this card I think that it works. This entry was posted on May 9, 2013 by Pinola Photo. It was filed under 1981 Donruss, C, Carlton Fisk, Chicago White Sox and was tagged with Baseball, Baseball Cards, Custom Baseball Cards, Donruss. You should look into obtaining a copy of Carlton Fisk’s 1981 Drake’s Cakes card. As you likely know, Topps and Drakes had an agreement during the early ’80s, and released a handful of card in every box of Drake’s snack foods. In 1981, in most cases, the same picture is used as the one found on the stock release from Topps. In Carlton’s case, instead of the close up of him in a Red Sox uniform; there is an action shot of him at bat in a White Sox uniform.